On the second day of our stay, we got up early and headed into town to meet the farmer and get a little introductory lesson to cheesemaking. Luca Compagnonis, the third generation to run this farm and cheesemaking operation, met us at the door to his facility with what we now know is the standard "I'm so sorry, my English is terrible" greeting. He then very kindly proceeded to show and explain to us how to make two types of goat cheeses in pretty excellent English. The few language impasses we encountered were navigated with a mix of French, German and Italian and we came away with a pretty clear understanding of the process. The primary product the Compagnonis are known for is called Tomme- an aged goat cheese made in a French style and holy cow is it amazing. After a lunch of 4 different kinds of goat cheese and goat sausage (circle of life) it was time to meet the goats so we drove over to the farm. Many of the animals were very curious about the two-legged goats that were looking at them over the fence so they jumped up to investigate. After nibbling our coats, shirts, jeans and hands, they decided that we offered nothing tasty and went about their business. Later, we helped do an evening feeding and milking. While the milking system is automated, we got to hand milk three of the goats which, once we got the hang of it was a lot of fun. Luca told us that one evening the machine wasn't working and he and his father had to milk all 300 goats by hand- a process that took 5 hours. My hands ached just hearing him tell the story. While we had the luxury of getting to dabble in goat farming for a weekend, I don't mean to imply that this life is anything resembling easy. The summer here was cold and rainy which affects every aspect of the farm, most importantly the output of the animals. Here in the mountains, the winter comes early making the warmer months that much more important to the success of the farm. As Luca's father explained to us- farming is truly a labor of love but so much harder than most people realize. After our time at the farm ended, we explored the town of Poschiavo. While we've lived in Switzerland for almost three years, the drastic differences in architecture and food from one part of the country to another still amaze me. Poschiavo is very Swiss. But the Italian influence is definitely visible. Outside many of the restaurants, sign for the "Wild Menu" were starting to appear. Fall is traditionally a celebration of the hunt (La Chasse) throughout much of Switzerland and because of this, many restaurants offer a traditional selection of boar and venison served with glazed chestnuts, spätzle, cabbage and poached pear. It's one of the best combinations of flavors on the planet and I will even venture to say in the galaxy. Luckily for us, our meal that night turned out to be our first La Chasse of the season. A few weekends ago, we took a trip to the canton of Graubünden in eastern Switzerland for a little birthday adventure among the mountains. Our destination: a tiny street of buildings close to the border between Switzerland and Italy. The hotel we stayed in had once been a stopover point for postal riders and traders and has been restored to honor its history. The walls are whitewashed, the floors are wide planks of wood and the mattresses are made with horsehair. If you are curious, horsehair mattresses might be the best sleeping pill on the market today. Upon contact, they provide a strong narcoleptic effect. In the spirit of its original use as a boarding house, the building is heated with wood stoves and all the guests eat home-cooked meals together, at a long farm table. All the recipes and food served are local to the tiny border town of Poschiavo. One of the perpetually fascinating things about Switzerland is the drastic differences in cuisine from one canton to another and sometimes even within cantons. We spent time in another part of Graubünden over the summer and the food there was extremely hearty with definite Swiss German influences. In this area the food was still filling but more delicate with similarities to some Italian dishes. I fell in love with a buckwheat pasta dish that is very iconic of the region as well as the local brown bread which was shaped in a ring and dotted with fennel seeds. One of the other guests in the hotel grew up in the region and told us that the ring shape allowed multiple loaves to be strung up on a wooden pole in the kitchen which was then hung from the ceiling. Every morning, we were treated to a spread that included fresh eggs, goat cheese and dessert leftovers from the night before (pictured here is a cherry Linzer torte. Swoon). While cooking our eggs on the wood-fired stove, my childhood dream of being Laura Ingalls Wilder was finally realized. All that's missing now is a calico dress and bonnet. By the use of "our," I think I implied that I cooked my own egg. Full disclosure: that implication is false. I left that work to my resident egg cooking master. On the first night, before dinner, we took a hike on the path near the hotel. From the path, we could see Poschiavo off in the distance. I am running out of adjectives to properly describe Switzerland. The light raking across the mountains fell into the "incredible" category though "cinematic" and "gorgeous" also apply. We came for goats. Specifically to meet them, feed them, milk them and learn to make delicious cheese. The hotel works closely with a local farmer who raises a herd of 300 goats. 40 of these hang out in the stable on the ground floor of the hotel. Upon meeting the hotel's 4-legged residents, I may or may not have revised my imaginary plans for our someday dream home to include this exact feature. Having goats on the ground floor means that one could theoretically visit them and scratch their necks before dinner. Theoretically. The goat story is really one that needs to be told on its own. I'll provide the second installment shortly. We spent the summer gently encouraging a local grapevine to wind its way along our balcony. It's grown almost three feet since we've moved in and the other day, I discovered a few small bunches hanging right next to the rail. As soon as they were off the vine we started eating them over the sink and the flavor is incredible. It's been decades since I last tasted a wine grape– the sweet, rich flavor and chewy skin are worlds apart from the crunchy, sugary table grapes that we usually buy. As Anthony put it– it's the flavor that grape flavored things are trying to be. I think this will be the entirety of our harvest for this year but hopefully next summer we'll be able to coax a few more feet and a little more fruit out of this guy..
After the last box had been unpacked in our Lausanne apartment, I flopped myself on the couch and announced to Anthony that short of the place burning down, there was no situation in which I could see myself moving again. Ever. I punctuated this declaration with dramatic exclamations and vigorous hand gestures to drive home my seriousness, Anthony ignored me. We've lived in Lausanne for two-and-a-half years. Long enough that when I think about the day we moved in, it seems like an event that happened in the fuzzy-not-too-distant-but-distant-enough past. Long enough that the memory of unpacking and reconfiguring our things is a little faded and less exhausting. Long enough that when, last spring, Anthony mentioned that he'd begun casually looking for a new apartment for us, instead of dramatically tying myself to the radiator and refusing to leave, I dramatically sighed and said "Okay. You can look. If you can find us the perfect place, I will entertain the idea of leaving." And look we did. But after every visit, we'd return home saying to ourselves "this still feels like where we need to be." Knowing how the apartment game works here, we settled in for at least a year of searching, possibly applying, and dealing with the potential disappointment of not being accepted (Lausanne has a 99% occupancy rate. Prices are high, competition is fierce and there is no guarantee of anything). 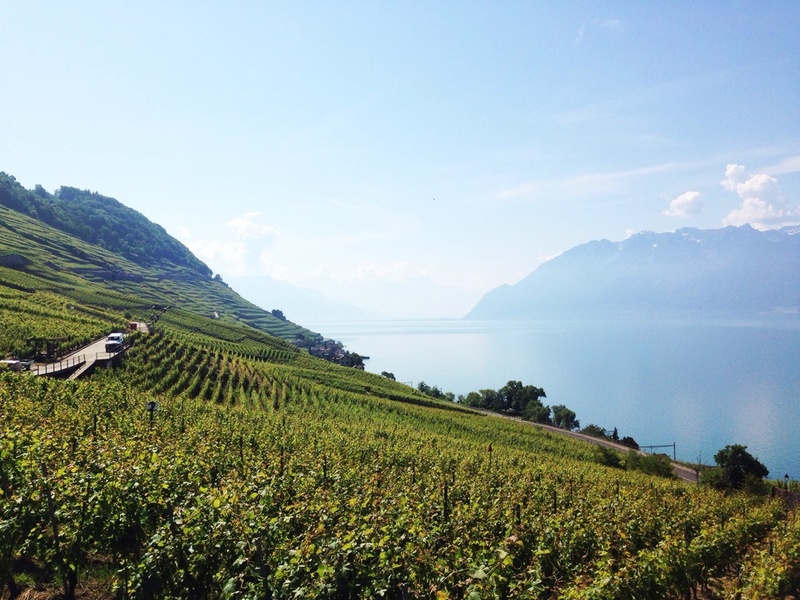 Then, on the first spring-like day of the year, we took a walk in the Lavaux. After wandering through the tiny vineyard towns, we stopped for water at one of the public fountains- and, turning around to enjoy the lovely little houses, we saw, hanging from the windows of one of the buildings, a sign. A Louer. For Rent. Until that point, we'd not thought of leaving Lausanne. We've walked to work every day for the past five years and a non-foot commute was not an idea we'd entertained. But at that moment, we thought, this might be a possibility. The apartment was new, with a lot more space and all the things we wanted that our current place didn't have. But it was removed from Lausanne and didn't have the beautiful vintage details the we adored about our home. My fear of change bubbled up and I started protesting that it was just too...too…different. Later, however, after looking at the photos again, I started seeing some potential in this new space. It wouldn't be the same sort of experience we'd had living in the city, sure. But it could potentially be a wonderful, new experience. So we applied. This was back in April and nearly every day since has been a flurry of nail biting, excitement, paperwork, more paperwork, anxiety, scrubbing floors and windows, planning, packing, and finally, finally moving. Even as we stacked all the moving detritus outside this morning to be carted away, I still can't believe that we did it. I tend to cling to the past so this transition has been difficult. But as we acclimate ourselves to this new life of vines and grapes and differentness, I can start to see our future here. It will not have the bustle of life in Lausanne but it will be exciting nonetheless.